Most students who work for the University of Missouri–St. Louis’ student newspaper, The Current, do so because they want to write articles, edit and gain hands-on experience in journalism. But the newspaper’s current financial situation has many burgeoning reporters and editors stepping into a new role: fundraiser. Last semester Managing Editor Kat Riddler found herself hanging decorative lights in the newspaper’s office and covering the desks in red and white checkered tablecloths. She and writer LaTwuanna Troupe and a handful of other staff members turned The Current’s headquarters into a makeshift Italian restaurant for the sake of a spaghetti dinner fundraiser. The event brought in $3,000, thanks largely to a business alumnus who worked at the paper in the 1970s. The newspaper currently seeks $10,000 by the end of a 30-day crowdfunding campaign that began April 3. About $5,900 had been raised as of April 23. A series of additional fundraising and awareness events earlier this month included Paperboy Week where staff handed out newspapers in The Nosh. And a trivia night is scheduled for May 1 in the Millennium Student Center Century Rooms. The Current staff members are taking on these efforts while also producing the weekly newspaper, taking classes and, oftentimes, working another job or two. Editor-in-Chief Anna Glushko, for example, works two tutoring jobs in addition to the 40 weekly hours she grinds out at The Current. 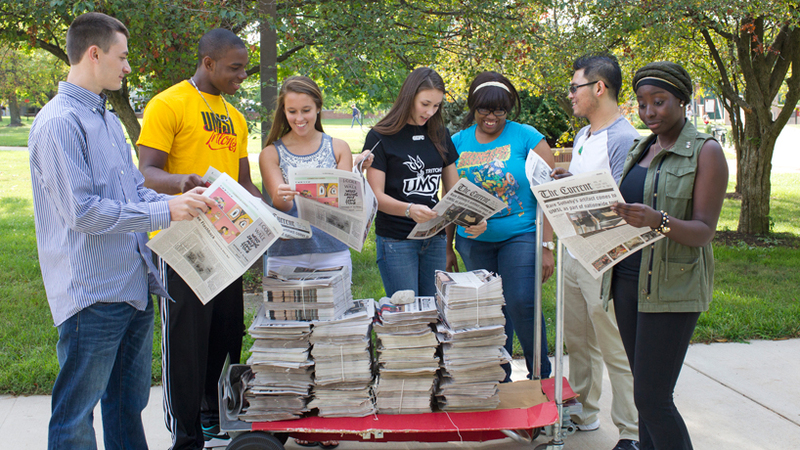 According to Current staff, about $40,000 per year is needed to produce 15 print editions of the newspaper per semester and pay staff stipends. The Current generated revenue this year from advertising and a subsidy from the campus. It no longer receives student organization funding. The newspaper hopes to generate enough fundraising dollars to cover that lost funding. Visit crowdfund.umsl.edu/thecurrent to learn more about The Current’s fundraising efforts. This story was written by alumnus Ryan Krull, MFA 2014, a student support specialist and adviser to The Current, who also teaches writing courses at UMSL.